If you didn’t already know… It’s Valentines Day this week. So today I have a pretty in pink alternative shoot to get you in the mood. So I’m very happy to be sharing this gorgeous styled shoot at one of Coco’s venues – the ultra romantic Eynsham Hall. I fell in love with these images when I was writing the beautiful listing for Eynsham Hall and I simply had to contact the creator and photographer Jen Marino. For me this wedding venue is darkly romantic, with it’s imposing exterior and sweeping grounds, so to see Jen juxtapose this with colour pops of girly pink, sugary treats in a bubblegum palette and an alternative take on bridal fashion, well… it was all quite magical. Oh and this shoot is a full on DIY extravaganza! All images by Jen Marino. I’m a Portrait & Wedding Photographer based in Oxfordshire. For a while I had this vision of an awesome styled shoot in my head and I just had to show everyone. I thought long and hard about how I was going to plan it, when I plan anything I like it to be simple, cheap and affective. I am a big believer of doing things for the least amount of money possible and making them look amazing. All it takes is a little imagination, DIY and some awesome friends in the business. I had this vision of bold but not too overpowering, mostly different shades of pink highlighted against creamy white, I wanted these images to pop! The model Lexi, a dear friend of mine, put me in touch with Charlie from CD Hair and I couldn’t thank her enough. Charlie is now a really good friend of mine and she is amazing at what she does! Before the shoot I noticed her work and I immediately knew that I had to have her for this project. I wanted long loose locks, pulled away from the face, just soft enough. Devon from The Button Room makes these incredible button bouquets… I couldn’t think of anything better! Devon completely understood the brief – various tones of girly pink but with an edge. She totally nailed it! Devon also supplied us with some gorgeous vintage jewellery to complete the look. As for the dress, I wanted it to be bold – an alternative take on the Classic Elegance of the princess dress. The dress was a bit of a DIY project and came in at around £50, I sourced a huge roll of soft netting from eBay and, with the help of my rather amazing Mum, created a frothy pink number. The corset was again an eBay bargain and gave a structured feel to the look. The ‘Groom’, Iain was awesome and took charge of his look wearing braces, a bow-tie and sleeves rolled to show off his colourful ink. The perfect classic edge to the Bride’s soft look. For the Wedding and Mr & Mrs signs I got two planks of fence wood that were scrap in my Mums garden, again thanks Mum! I sanded the planks of wood down and varnished, creating a great base for the stencilled lettering – again homemade! DIY tissue pom-poms were tied in the trees as a pretty backdrop, I used fishing wire to hold in place to give the illusion they were floating from the branches. I REALLY wanted a sweetie cart involved… The Sweetest Cart provided the delicious goodies of cake pops, milkshakes, and delectable cupcakes with pretty little Just Married flags. Kirsty and Keeley interpreted my vision brilliantly and their cart looked amazing. A perfect alternative addition to your wedding feast! 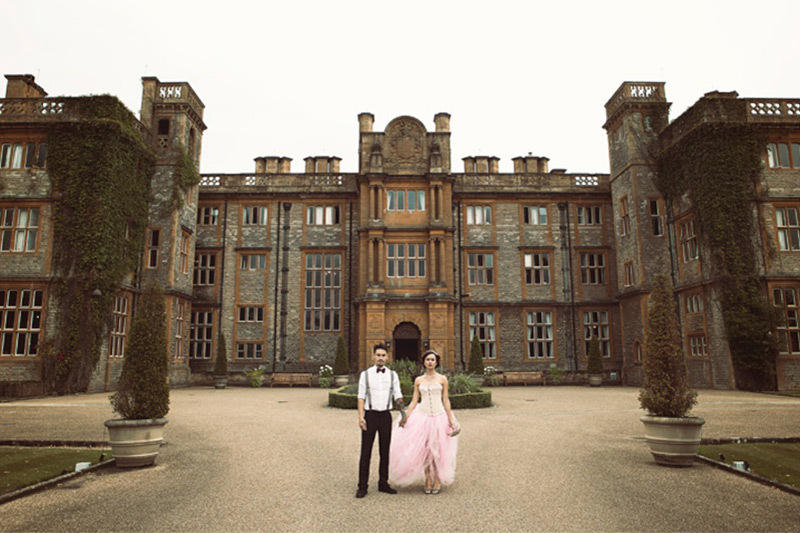 Time to mention the venue… The backdrop to the shoot was Eynsham Hall, Oxfordshire. To be honest, from the start of the planning, before anything else, I knew this is where I wanted to shoot. I had seen Eynsham shot by various Photographers and their images always looked so beautiful, but I had never seen any ‘alternative’ styled shoot, so I thought it would be an awesome canvas for my style. The amount of space I had to be creative with was incredible and the photos can now be seen in their 2014 wedding brochure… Which is pretty nice isn’t it. So that’s it… My alternative spin on a girly classic wedding. So what do you think of Jen’s alternative wedding style…? Are you tempted by a confectionary cart of delicious treats…? Or maybe you fancy channelling the lovely Lexi in her pink tulle tutu…? 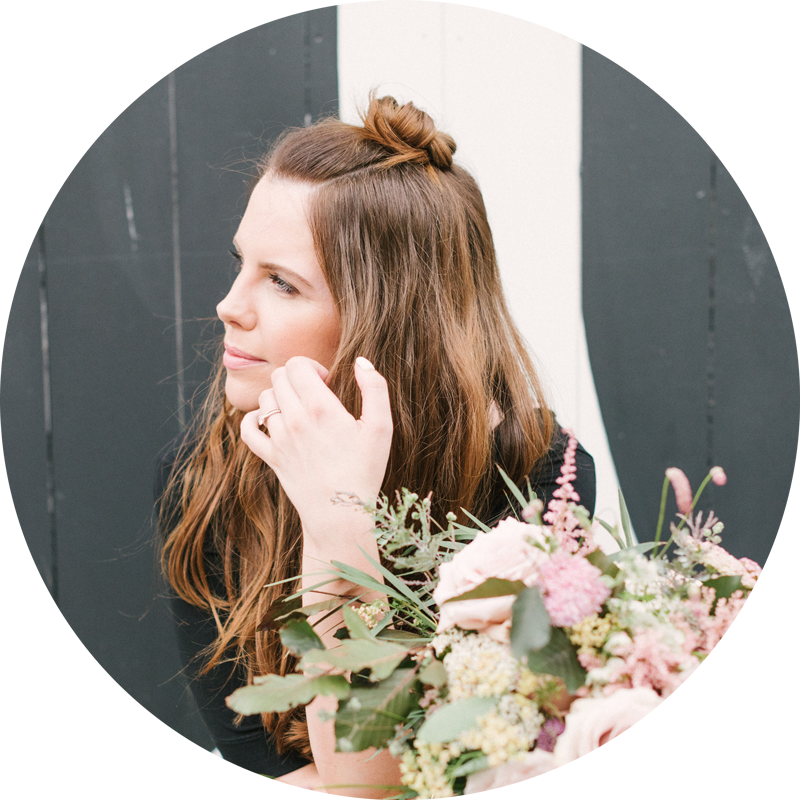 Thanks again to Jen for sharing her gorgeous styled shoot. Oh and if you fancy seeing more of this venue then hop across to the Eynsham Hall listing – it’s rather special.